We’re unveiling a very exciting feature – Blog Health. Blog Health takes everything we know about why blogs get deindexed and shows you what you need to do to avoid deindexation. Low number of blog posts: less than 10 posts after 30 days from creation date. No recent blog posts: no post in last 30 days. Low number of comments: less than 5 comments after 60 days from creation date. Too many redirects: too many 301 redirects. 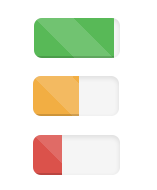 When everything is calculated, it will show you a Health Bar – green, orange or red. We’ll be analyzing wrongly diagnosed deindexed blogs (with green bar) and improving our algorithm. See how to resolve reported issues in our Help Center. That’s a nice feature. Always happy to see you guys keep improving your product….I’ll be sticking around! What does it mean “Too many redirects: too many 301 redirects”? And when this feature will work? Is it already available? It means you have too many 301 redirects (probably due to a plugin). Instead of 301 redirects, rebuild those URLs and put content on them. Super useful feature, thanks for implementing it guys! Dejan – about the comments, I always turn them off on pbns as they are always spam. Is this part of the algorithm as you know it? it’s just something that makes the site look more natural. It has a very small impact on Blog Health, so if you have good results with it, don’t worry about it. Thanks for adding this, really useful. I hope more updates roll out that are awesome! Contact our support and we’ll take a look. How many pages are needed to consider healthy?